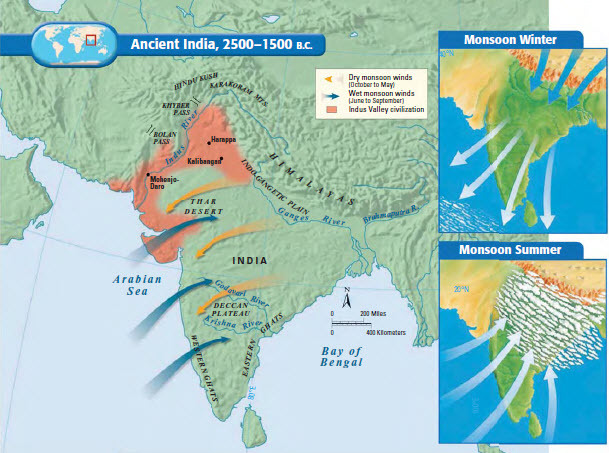 Was the abandonment of the cities and eastern migration tied to failure of the monsoon? I was watching the 6 part BBC's 'Story of India' and had a thought about the abandonment of the Indus cities and migration eastward due to the failure of the monsoon. Could this failure of the monsoon be due to the eruption of the island of Theara north of Crete? The timing seems close. The ash cloud traversed Egypt, so it would have ended up in the Indian Ocean. Is there any evidence of ash deposits in the Indus river valley from the eruption? Is it possible the ash went too far south to show up and still affect the monsoon? Just curious if anyone has thought of this before. There is no evidence that cities were abandoned due to changing rainfall patterns. There is also no evidence for a long term failure of the monsoon at the end of the Indus period. Many Indus cities, such as Harappa and Mohenjo-daro, were not abruptly abandoned and continued to be occupied for hundreds or thousands of years after the end of the Indus cities.